My love affair with YSL is never-ending. It is extremely difficult for me to find fault with their ultra-chic and elegant bags. The Calypso Bag is one of those designs that's perfect in every way. 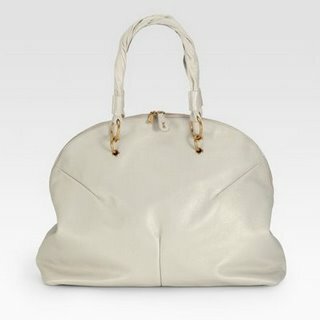 The luxurious pearl white Riz de Grain leather, twisted top handles, loosely-structured shape and roomy 19 x 14 x 6 size make this YSL bag purchase (eerily similar to the 'Muse' except for the less obvious stitched "Y" on the front exterior) a no-brainer. My next observation is merely that and not meant as a criticism. For the hefty price of $2095, I expect a better interior lining than canvas (as nice as that canvas may be). Even that small detail cannot detract from the 'Calypso's' understated beauty. It's a pricey bag, but YSL is on fire lately and their bags have "staying power" written all over them.